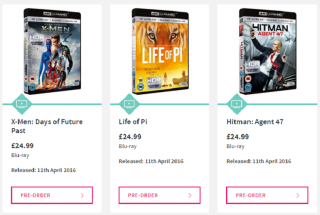 The first 4K Ultra HD Blu-ray discs are on sale in the UK | What Hi-Fi? 4K Blu-ray movies are finally available to buy in the UK, with titles such as Fantastic Four and Kingsman on sale for £25 and set for release on April 11th. It's a good week for anyone waiting for Ultra HD Blu-ray, the brand new 4K disc format. The first Ultra HD Blu-ray movies are now online and available to pre-order in the UK, all of them listed with an 11th April release date. There are eight 4K Blu-ray titles in total: Fantastic Four, Maze Runner: Chapter II - The Scorch Trials, Kingsman - The Secret Service, The Maze Runner, X-Men: Days of Future Past, Life of Pi, Hitman: Agent 47 and Exodus - Gods and Kings. You can pre-order all eight discs via both HMV and Zavvi, though there's no sign on Amazon UK. The 20th Century Fox titles, which were confirmed to be heading for 4K Blu-ray last year, also come with HDR and are bundled with a Blu-ray and a Digital HD copy. 4K Blu-ray discs have already gone on sale in the US, with Lionsgate confirming releases including Sicario and Expendables would arrive in 4K and with a Dolby Atmos soundtrack. Sony Pictures has also announced its first Ultra HD Blu-ray titles. The news follows this week’s confirmation of the Panasonic DMP-UB900 UHD Blu-ray player, which is due to go on sale in April for £599. Samsung’s UBD-K8500 4K player is due on sale later this month in the UK, having already gone on sale in the US for $400. Looks like it’s time to start taking Ultra HD Blu-ray seriously… Will you be buying the new disc format? Let us know in the comments below.